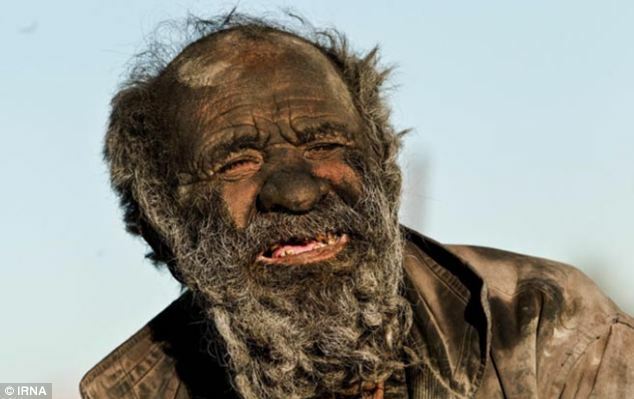 Iran was again in the headlines earlier this week after revelations of an Iranian man who has not had a bath for 60 years. Mr. Amou Haji adopted a lifestyle of a vagabond after some emotional setbacks in his youth. Mr. Haji is now looking for love but the eligible lady has to accept his lifestyle. Amou Haji does not wash and anything clean is an aversion to him. He believes that cleanliness will make him sick. Mr. Haji’s food is usually rotten animals since he does not like clean food. Decomposing porcupine is a favorite of his, a great delicacy to him. Amou Haji’s method of relaxation is smoking in the evenings. He does smoke conventional stuff. He has his own blend of ‘tobacco’ which is actually dried animal faeces. He puts these faeces in a pipe which he then lights up. 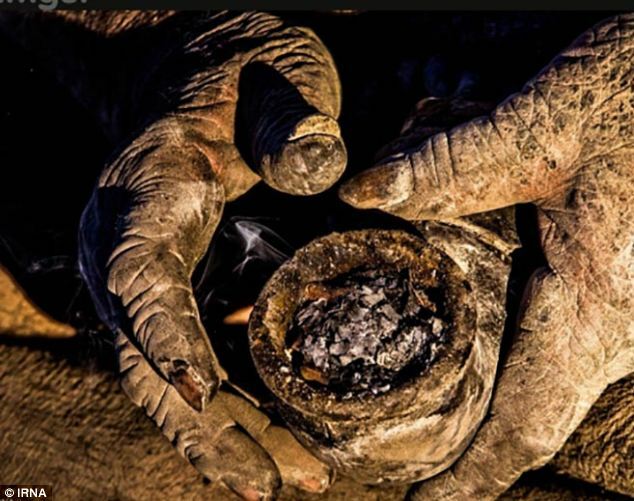 The man drinks an average of 5 liters of water daily, from an old rusty and oily tin can. When Haji wants to groom himself, he uses car mirrors. Fire is his tool for shaving, he burns his hair locks using fire instead of visiting a barber. Amou now lives in an open brick shack that was built for him by locals in his village of Dejgah in southern Iran, province of Fars. On other days, he may spend the night in a hole in the ground that resembles a grave. For clothing, Haji wears rags and a war helmet in winter to keep off the cold. Local young men once tried to give him a compulsory shower but he escaped, he says he was lucky to have escaped. 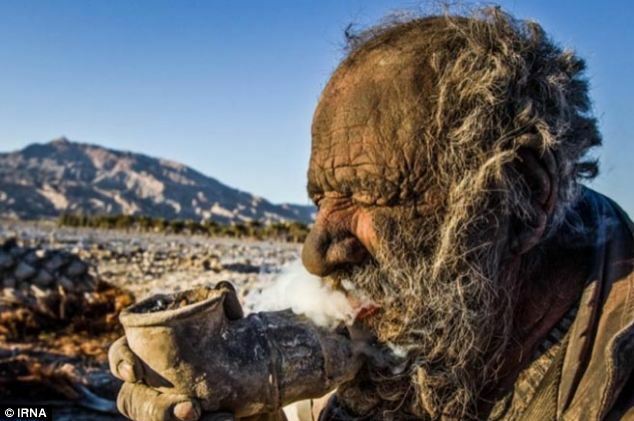 The longest recorded time that one has gone without a shower is by 66-year-old Kailash Singh from India. 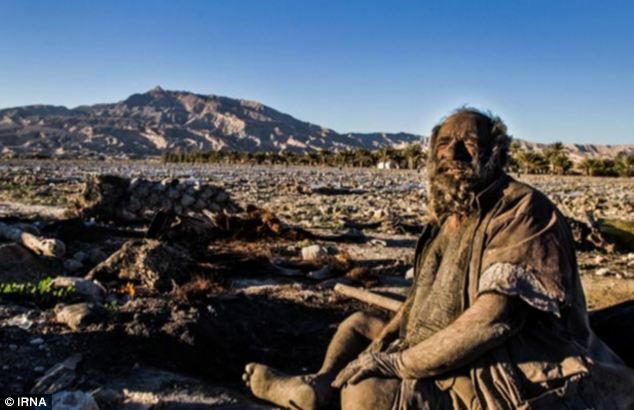 He had not had a bath for more than 38 years. Amou Haji seems to have beaten that record by close to a double.